Eastwind Import Home US - Al Haig - Al Haig Today! Description: Long out of print, now reissued on CD for the first time in 25 years! 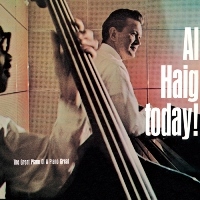 Pianist Al Haig has a special place in the hearts of many Japanese jazz fans. His style is undoubtedly based on bebop and Bud Powell, but he could make the piano sing with good tone, and had a certain sophistication, coolness and depth to his playing. Perhaps due to his difficult personality and alcohol problem, the present album Al Haig Today! is the only recording he made in the entire 1960s. Listening to his excellent performance on this exceptional trio album, one wishes he had recorded more during this period. Recorded on July 6, 1965 in New York. Mono. Originally released by Del Moral Records in 1965. This reissue CD released in Japan by SSJ Records in 2014.